First ever NON-LETHAL WHITE-TAILED DEER BIRTH CONTROL STERILIZATION SPAYING RESEARCH PROGRAM in the history of Maryland on private land in a residential community! 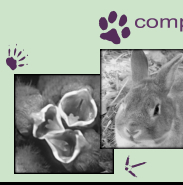 In February of 2017, Wildlife Rescue, Inc and The Humane Society of the United States worked together to continue the white-tailed deer birth control program Wildlife Rescue started in 2011 to manage the deer population humanely in a suburban neighborhood in Baltimore County, Maryland. The HSUS donated the services of three staff members who hold the required licenses granted by the Maryland Department of Natural Resources to assist Wildlife Rescue and its volunteer staff of veterinarians and dedicated individuals with capturing and handling female deer, who were surgically sterilized and then released back into the wild. Wildlife Rescue and The HSUS agreed that it was mutually beneficial to promote and advance the use of humane, nonlethal deer management methods in urban and suburban landscapes by continuing a program that other communities can replicate. 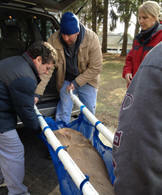 As in the past years, we were overwhelmed with the outpouring of volunteers who donated their time to save the deer. We would like to send a Very Special Thank You to our “Deer Spay Team 2017”, Dr. Keith Gold our Principal Veterinarian, Dr. Tamie Haskin and Dr. Kaitlyn Heydt of Chadwell Animal Hospital, Dr. Sue McDonough and Dr. Kerry Milliken! Veterinarians, who took time off from their practices and donated their services. Chadwell Animal Hospital’s vet techs Melissa Goodman, Alexis Finley, Kelsey Kelch, Krystal Smith and Claudia Johnson. Volunteers Debbie LaTorre and Jean Ayers for your untiring dedication year after year. And to our Board Members, Meredith Callahan, Matt Matthias, Lierra Lenhard and Enid Feinberg for everything you did! We would also like to thank, Stephanie Boyles Griffin, Senior Director of HSUS’ Wildlife Fertility Control Program and Director of the Botstiber International Institute for Wildlife Fertility Control Wildlife Protection program, Kali Pereira, HSUS Senior Deer Program Manager, and Dave Pauli, HSUS Senior Advisor for Wildlife Response & Policy. The success of this project continues to be directly related to the donation of these volunteer veterinarians, volunteer technicians, other volunteers and The HSUS because their generosity resulted in a significant reduction of the cost per doe. We look forward to adding some new communities in Maryland now that the staff of the Humane Society of the United States are licensed to take on new deer sterilization and immunocontraception projects. How It Began and Progressed? This project started in 2011, after years of investigation into non-lethal methods for co-existing humanely with whitetail deer. Wildlife Rescue, Inc., funded a research program to prove the efficacy of sterilization spaying of deer, instead of killing them. Over these past 6 years we have spoken with private citizens, communities, government entities and the press throughout the United States about our groundbreaking project. One of those interviews was with WTOP reporter, Michelle Basch. That interview led to the Humane Deer Management group in Fairfax, VA asking us to do presentations. From there the first non-lethal deer spay project in the history of Virginia in Fairfax City was put into motion and they just completed their second year. Tom Jackman, a reporter for The Washington Post did a series of articles about the Fairfax project. The Humane Society of the United States issued a press release where Stephanie Boyles Griffin, Senior Director of Wildlife Response said: “We are proud to support Fairfax City and applaud the city’s groundbreaking efforts to develop and implement a humane, effective and sustainable deer management program that everyone can live with, including the deer...” Then from the HSUS press release we received a phone call from Dr. Charmaine Foltz, DVR Director of the National Institutes of Health in Bethesda, MD inquiring about our deer project. From that call NIH, the #1 institution in the U.S. who looks out for the health and well being of the American citizen, met with our principle researcher and chose deer sterilization spaying over using any other form of lethal or non-lethal deer management. And to quote the NIH Record on Dec. 5, 2014 “After looking at all options, particularly non-lethal methods, the NIH identified the most effective approach that will manage, stabilize and potentially reduce the population in a long-term, safe, humane and socially and biologically acceptable manner,” said Dr. Alfred Johnson, director of the Office of Research Services. It gets even more exciting because we have now accomplished what many said would never happen. The Maryland Department of Natural Resources, approved surgical sterilization as a deer management technique and it is no longer research in Maryland. Both NIH and our Wildlife Rescue project, in February 2015, were done under the first ever Deer Sterilization Management permits. We want to thank the Maryland Department of Natural Resources, Wildlife & Heritage division for having the courage and foresight to be the first state to permit sterilization as a management tool for deer population control. 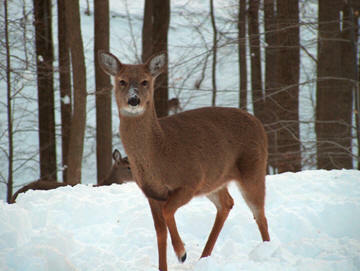 We are now seeing natural mortality reducing the deer population. It is sad to see some of our older does pass away, but it would be much sadder to see them killed. The contribution of observing them day in and day out to show the major benefits of non-lethal deer sterilization birth control proved invaluable. Benefits like less browsing because deer do not have the caloric requirements of almost 7 months of pregnancy and 3 months of nursing fawns. We observed spayed does eating for significantly less time than pregnant lactating does who ate up to 3 times longer. We observed how they continue to stay together and the surgery does not change their family dynamic. We know that even though they still reside in the community, they serve as infertile placeholders who help keep out new deer while consuming much less. We observed how sterilized deer do not go into heat and they are not chased by bucks during rut, reducing deer vehicle collisions! Our observations confirmed lower deer populations can be achieved in a humane manner without killing deer. We receive no government funding. This project occurred on private land and is 100% funded by Wildlife Rescue, Inc. as a public service to the community and the State of Maryland through donations. 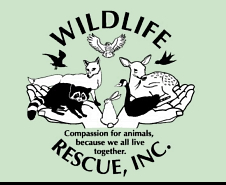 If you would like to make a donation to support Wildlife Rescue, Inc and/or the Non-Lethal Deer Program Fund, please click the Donate button and email us that your donation is for the Non-Lethal Deer Fund. Would you like to learn more about each phase of our deer project? In 2011 we brought in top experts from across the United States to guarantee that this research project was conducted under the highest standard for success. Dr. Steven Timm and Dr. Anthony DeNicola, PhD of White Buffalo Inc. had recently established a protocol for rapid ovariectomy using a direct surgical approach. Their work involved the combined experience of Dr. DeNicolas' team of researchers and the surgical and field experience of Dr. Timm, and established a technique to provide surgical (definitive) sterilization in a field environment. 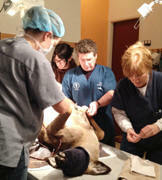 Under the guidance of Dr. Timm, our local veterinarians were also taught this rapid ovariectomy procedure. 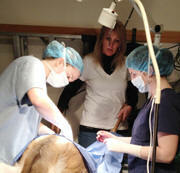 A procedure that is actually less intrusive than when a cat or dog is spayed since only the doe’s ovaries are removed. Our original goal was to sterilize 25 does in the first year, but within days, we exceeded our own expectations. We sterilized 33 does in the first stage of this study. Twenty-five percent of the does were first corralled in a capture rotunda developed by the USDA to capture and handle deer in a minimally stressing, extremely humane way, which was safe for both the deer and workers. The USDA drove it up on a trailer from Texas for this field trial. We discovered the rotunda was not as safe and reliable in our cold climate and we switched to remote immobilization darting techniques for the balance of the deer that were sterilized. We would like to thank the USDA for both their support and participation of this project. Using only remote immobilization darting, we were able to perform the rapid ovariectomy procedure on 17 more does. The first 14 were sterilized in just a few days and then 3 more were sterilized in an additional day that was added over a week later. As in 2012, only remote immobilization darting was used and we were able to perform the rapid ovariectomy procedure on nine more does. The most interesting challenge this year stemmed from the success of the project. Now for every 10 does we observed, there was only 2 who could be darted because 8 were already sterilized. So it took a little more time and patience to find a doe who had not been sterilized already. In February of 2014 we completed last phase of our research into non-lethal deer sterilization birth control. As in 2012 and 2013 only remote immobilization darting was used and we were able to perform the rapid ovariectomy procedure on 9 more does with one additional doe who had been shot with an arrow. Her injury brought a different perspective to the project this year because many of the people involved had never seen first hand the damage that results from just being wounded by an arrow. There were tears and shock at the infection and suffering she must have been enduring. The veterinarian did his best to relieve her pain and save her. Since this was the fourth year of our sterilization research project, we were required by MD DNR to once again contact at least 50 residents within a 1/2 mile of our site. They were given the option to either sign their support, opposition or indifference to the sterilization project continuing in our community to manage the deer population. We were very pleased when 90% signed their continued support and told us over and over again how beneficial our project was in terms of less browsing, accidents and more. In February of 2015, we were permitted to manage our deer population in an open suburban community in Baltimore County, MD using the non-lethal deer sterilization spaying procedure. The MD DNR licensed Deer Cooperator who was our original principal researcher darted deer to immobilize them for the volunteer veterinarians to perform the rapid ovariectomy spaying procedure. During the 5th year of our deer project in 2015 when we were permitted to manage our deer population using non-lethal deer sterilization, our principal researcher/cooperator suggested doing our project every other year given the challenge of finding does who were not already sterilized. 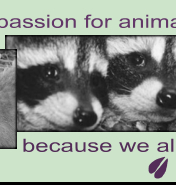 As the Board of Directors of Wildlife Rescue, Inc., we had to agree. It did make more sense to manage our deer population with sterilization every other year since we were continuing to see a limited amount of untagged does in the project area. We also had only observed a couple of resident fawns all year. That is until a group of orphaned fawns from hunting season showed up, but still putting us in a good position to wait. Deer birth control continued to make more progress in Maryland with both the National Institutes of Health (NIH) in Bethesda, MD using sterilization for a 2nd year and at the National Institute of Standards and Technology (NIST) in Gaithersburg. At NIST the Humane Society of The United States utilized the expertise of our principal researcher and veterinarians who had worked on our deer project in Baltimore County. Remote-injection tranquilizer darts were used for capture and 61 surgeries were done. 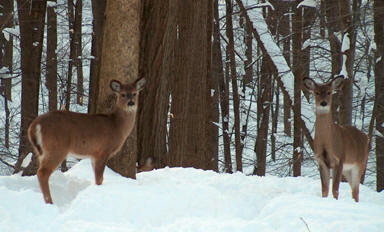 Both NIH and NIST were done under MD DNR Deer Sterilization Management permits. As the Board of Directors of Wildlife Rescue, Inc., we are charged with a great responsibility to honor the memory of our founder Gerda Deterer. A woman who devoted her life to alleviating the suffering of wildlife. Her dream was for people to co-exist humanely with the deer and all wildlife. We would like to thank the Maryland Department Of Natural Resources for helping us to honor Gerda in a way she could only dream of. In the past, farmers would drown kittens when they were born to keep down the cat population. We no longer use such barbaric ways to control birth rates, and now spaying cats is common practice. All we want is to move forward as a modern humane society in the same way when it comes to deer and all wildlife. Because, even if something is free of cost, it does not make it right or socially acceptable to use it. Wildlife Rescue, Inc believes the citizens of Maryland in suburban residential neighborhoods where the use of weapons are both dangerous and socially unacceptable should be afforded the option to use non-lethal solutions. 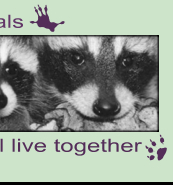 By conducting this program in a residential community, we are continuing our dedication of helping wildlife and finding humane solutions for their co-existence with Maryland citizens. While staying true to our mission to help injured and orphaned wildlife, we will also continue to research and educate the public about any new non-lethal solutions that will protect our wildlife.